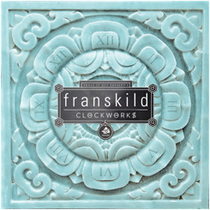 franskild release their latest single ‘Clockworks’ today on Sweat It Out! Records. As a pair of Swedes currently working out of Denmark, franskild have been slowly edging their sound into the backs of people’s minds for the last year through their support by BBC Introducing. Their previous EP ‘Eden’ was described as “melancholic, dreamlike house music” by Mixmag and earned the pair the chance to remix Maya Jane Coles’ ‘Burning Bright’ from her latest album ‘Comfort’, as well as reworking DEVolution’s ‘With U’ on and Style Of Eye ‘Kids’. The original mix delivers rhythm and a soft vocal performance from Love’s sister, Rebekka Ojensa, which has given the track a more tranquil and whimsical side to house music that you don’t hear much. On the flip side the remix package delivers mixes from Ed Banger resident Riton, Silversix and Juan Du Sol, aka Jon from Aussie newcomers Rufus. Franskild’s next UK show will take place at The Sebright Arms, London on the 27th February with Live Nation, and they are confirmed to play Sonar 2014 on tonight in Stockholm. Check ‘Clockwork’ below.